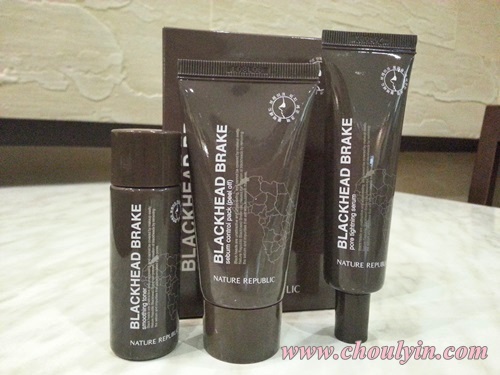 Thanks to OnlyBeauty, I got the opportunity to review Nature Republic's Blackhead Brake 3-Step Kit! I was really hoping to get selected for this review because I've always had a problem with blackheads which makes my pores enlarged. This particular range of product is quite new to the Malaysian market, and comes in a little brown box of three products, each representing one step in the removal of blackheads. It's a pretty small product, so much so that I thought it was a sample set >.< (My bad). However, the salesgirl that I spoke to said that they are trying to get individual products to Malaysia, but for now, they are selling it in a 3-in-1 pack. This toner gently dissolves blackheads and opens your pores so that the blackheads can be released to the skin surface. This is easily applied using a cotton pad. This nose pack contains Moroccan Lava Clay which has sebum absorbing capabilities. This product works like a mask and is applied all over the nose (making it a little like the pore packs that you can get at most pharmacies and drugstores). The fluid is white, and pretty sticky, which feels a little bit like half-dried gum. It sticks to your fingers, and you would need quite a large amount of the product to cover your entire nose. Once the ‘mask’ is dry (for me it took about 15 minutes, but I left it a little longer just in case), you peel it off from the bottom up. Unlike most pore packs, the peeling doesn't hurt one bit, and there was no redness that I could see. Upon closer inspection, I could see that my blackheads have been removed (not all, but quite a substantial bit), and I was quite amazed at the product. If you scroll back up to look at the picture above, you would see that I have pretty much covered the product evenly over my entire nose. 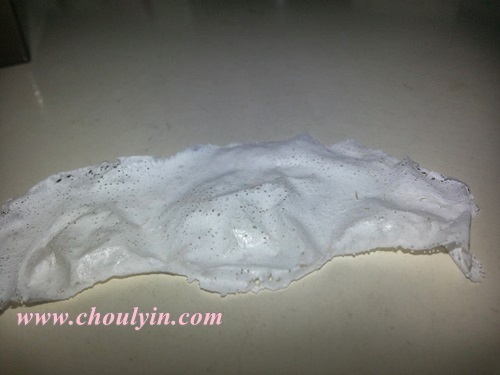 But in the picture below, you can see that there are tiny holes in the pore strip that has been removed. I think this is because when you apply it, there are tiny bubbles trapped in there, and when it dries out the bubbles pop. So, I guess one bad thing about it is that, you might not get full coverage of the entire nose when you apply it. This is the final step of the kit that will shrink your enlarged pores (after the blackhead has been removed). The serum absorbs quickly, and doesn't leave a sticky feeling, therefore enabling you to apply your moisturiser after the entire process. After pic. See any big difference? Verdict: 7/10. I would give it an 8, if not for the little bubbles that appear after the nose pack dries. But other than that, I really liked the product, as it is a very comprehensive step to removing blackheads. I was also pleased that most of my blackheads have been removed, and I quite like the pore-tightening serum cos it helps to ensure that my pores are closed up to prevent further dirt from entering the pores. I even tried it out on le bb (who has quite a lot of blackheads), and it also works on him, so if you're a guy reading this post, fret not, it works for dudes too! Woooaahhh.. you've so many products to review..and yes, i see the difference.. maybe i can *slide* over to nature republic this weekend. hahaha. Can apply to other part of the face other than the nose?